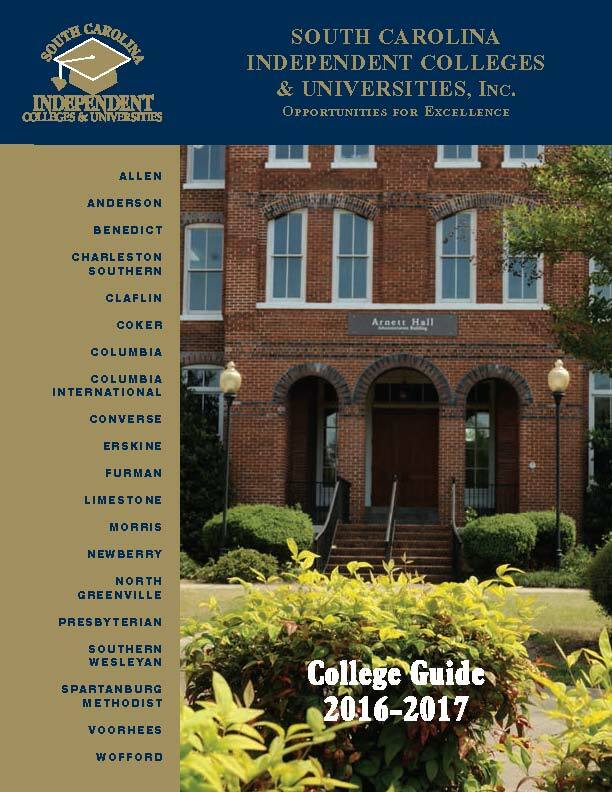 COLUMBIA, SC — The 2016-2017 print and digital editions of SCICU’s popular College Guide are now available to students, parents, school counselors and anyone interested in learning more about the 20 private non-profit colleges and universities that are members of SCICU. An initial distribution of more than 600 printed copies were sent to high schools, SCICU trustees, and members of the General Assembly in September. The College Guide includes a concise statement on the benefits of a liberal arts education and a discussion of the cost of attendance as a value proposition. The publication features 2-page profiles of the member colleges and universities, a list of visitation days, and detailed information on federal and state student financial assistance. To emphasize the core principles of teaching and learning on our members’ wonderfully diverse campuses, the Guide features the 20 recipients of SCICU’s 2016 Excellent in Teaching Award. Please click here to view digital edition of the 2016-2017 College Guide. In addition to hot links, page-flippers, enhanced navigation tools, and videos, the new digital edition will be formatted for iPhones, iPads, Androids, and other Smart (HTML5) platforms – the social media world of today’s students and a growing number of their parents. SCICU is grateful for this year’s College Guide sponsors: American Student Assistance, Haynsworth Sinkler Boyd P.A., and South Carolina Student Loan Corporation.